Drifting: Delicious Lamb or "buut Liisaaa, you saiid you looooved me"
Delicious Lamb or "buut Liisaaa, you saiid you looooved me"
Lately I've been craving lamb. I've also been feeling pretty lazy kitchen-wise. My solution was marinaded roasted veggies and lamb. I only used a few dishes, and made enough food for four meals. First off is the marinaded lamb. So the picture looks kinda gross, but it tasted great. 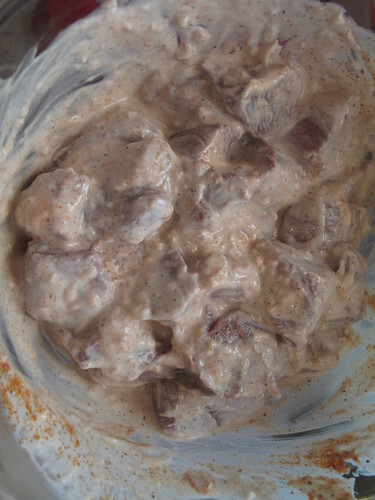 I put about a pound of lamb stew meat in the marinade, cover it and got to work on the rest of the food. Next time I'd splurge for a better cut of meat, and have the butcher chunk it for me since the stew meat can be a bit dry if you don't actually cook in in a stew. Next up were eggplant and onions. 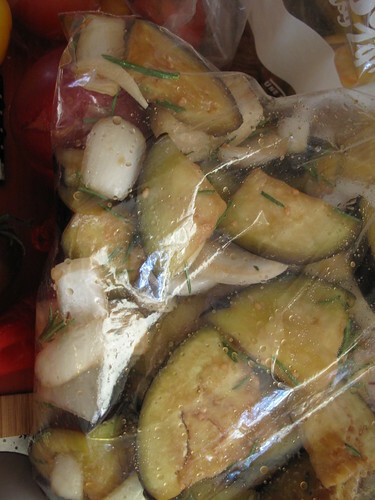 Roughly cut one medium eggplant and a large yellow onion into wedges and put in a large ziploc bag or a bowl you can toss the it all around in. I added the marinade straight into the bag one ingredient at a time, and just tossed it around a few times over the hour or so it marinaded. 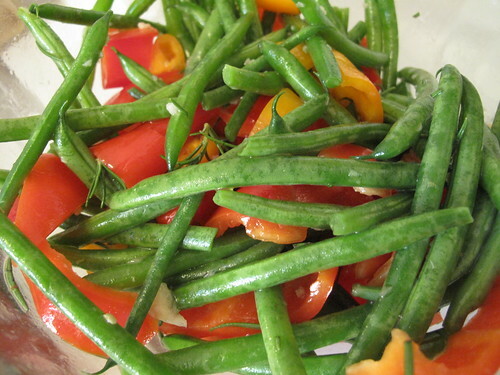 Last up were the green beans and bell pepper. This marinade didn't overpower the natural sweetness of the peppers or the beans, and the splash of vinegar really livened the whole thing up. I preheated the broiler and spread the lamb out on a foil-lined high-sided baking sheet. I put it 6 inches from the broiled flipping it over after 6 or seven minutes, and cooked for about 15 minutes total, although it probably was done after 10. I still have a proclivity to overcook meat on my first try with something new, still learning after 13 years not touching the stuff. I switched the oven to bake at 350 and moved the cooked lamb to a bowl and covered it with foil. Next I spread out the eggplant and onions of the same baking sheet and roasted them for 15 minutes, before stirring them around and roasting longer. I think they cooked for about 1/2 hour total, stirring more often over the last 15 minutes. I scraped them off the sheet into another bowl and covered. Last to cook were the beans and peppers I roasted them for 10 minutes on one side, stirred up and roasted another few minutes. I made a really quick tzatziki to serve the food with. The combo of herbs I used isn't totally traditional, but it's what I had on hand, and ended up tasting great. 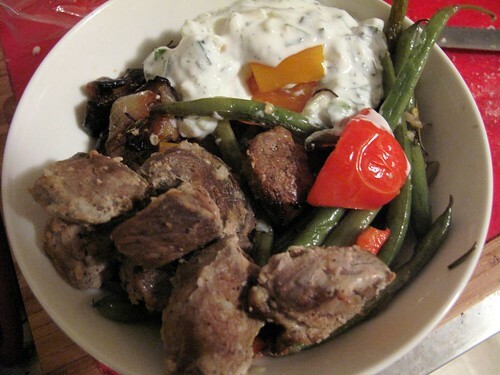 To serve I put the lamb and veggies on some white rice, and topped with a scoop of the tzatziki.